Two things kept poking the back of my mind while we were going through the series on identity. A firm foundation for our identity is best built on the never-changing truth that God’s love for us is always present –and that love is not dependent on the things we do. While I believe that to be true, I wonder…can we truly accept it without experiencing love and acceptance from a flesh and blood person? I wonder if we need people in order to believe the truth that God loves us. The second thing: will people mis-interpret the idea that actions don’t affect God’s love for us, and conclude that our actions and how we live doesn’t matter? Because I strongly believe our actions do matter…they just don’t affect God’s love for us, or serve us well as a basis for our identity. We’re beginning a new series today that originated as one of Steve Fawver’s ideas. I think we do need people. We need others, we need examples in our life with God. Love for God and obedience to God are the primary things which direct our lives, but community helps us experience them and gives examples and opportunities for living it out. We’re calling this new series, “Cloud of Witnesses”. Hebrews 11, part of which was read for us earlier, lists a bunch of biblical examples of faithful saints, obedient people who serve as examples and witnesses of how to faithfully move toward what God has promised. The phrase “Cloud of Witnesses” itself comes from Hebrews 12:1, which we will look at in just a moment. In the weeks and months ahead, we want to look carefully at the lives of people who are witnesses and examples of what it means to faithfully follow God. We’re not looking in order to put these people on a pedestal; rather, the goal is to see in the good and the bad of their lives how they looked at Jesus and followed his way of life with purpose and resolve. The goal each week will be for each of us to be challenged and encouraged to follow Christ’s way in OUR journey, in our lives. Looking at biblical, historical, and personal examples in the “Cloud of Witnesses” will push us deeper in following Christ! We’re shaped by all kinds of people, to varying degrees. For example: I love baseball because my dad exposed me to it before I could talk. Les Miz is my favorite musical because it was the very first Broadway-quality production Elaine and I had ever seen when my aunt and uncle took us to it in San Francisco decades ago. I try day in and day out to be responsible, in part from watching my grandpa get up every morning at 4:30 am, sick or not, to deliver the mail. I curb my natural tendency to talk and work harder at listening in part because of an apt word Elaine said to me 26 years ago. Because of the teaching of Ian Pitt-Watson, I work hard each week to try to translate the truths of the bible into words and pictures that fit our daily lives. I try not to only spend time with the people I know and like, but also seek out those different from me because of the example of Janos Plescko almost 30 years ago. We are all shaped by people. Sometimes intentionally, because we admire them and want to be like them; sometimes unintentionally, as we take on by osmosis the characteristics and likes and dislikes of the people around us. This series will aim to do two things. We’ll intentionally look at people who influence us toward Jesus. And we will consciously remind ourselves that we’re not just imitating or idolizing those people, but letting their example of following God guide us forward. Forward! Hope! This is what draws the restless places in my soul. Our talk about identity was necessary, foundational. We need to admit the ways we try to pretend, the ways we try to craft our image and “perform” in order to prove our value…all of that is fragile and ultimately fails us. We need to choose to accept the gift of God’s love. But we don’t want to spend our time only looking inward, only focusing on ourselves. The beauty of an identity rightly rooted in the unending love of God is that we are then equipped and prepared to obediently and boldly follow Jesus on the radical adventure of a life of faith. God is always ahead! God is always leading us forward! So as we think of the examples in Hebrews 11 and in other parts of the bible; as you think of people like Francis of Assisi and Martin Luther and Catherine of Siena and George Fox; as you think of your versions of Ian Pitt-Watson and Janos Plescko and Elaine…as we have this great cloud of witnesses in mind, remember what they all have in common at their best. They are people who keep their eyes fixed on the purest example of faith, Jesus Christ. Let’s look at Hebrews 12:1-2. I started loving this passage when I was a baseball player. Now that I’m the dad of runners, I understand much more deeply the many running images in this passage. The picture in the text is that we are surrounded by people who have gone on this road ahead of us. There is a cloud of witnesses, cheering us on to run OUR race with perseverance. We can learn from their example, yes…but also there is the beautiful picture of the ones who know what it’s like cheering us on to run with abandon after Jesus Christ. I get some of my favorite pictures by accident. At track meets, I’m focused on the action, and then I get home and look at the pictures and it’s often the background that becomes the focus for me. 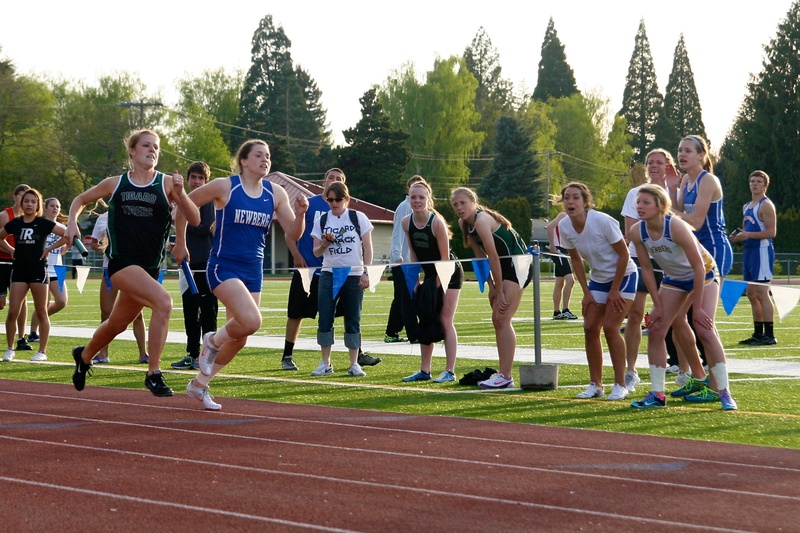 This race was two and a half years ago, Newberg’s 4×400 team. 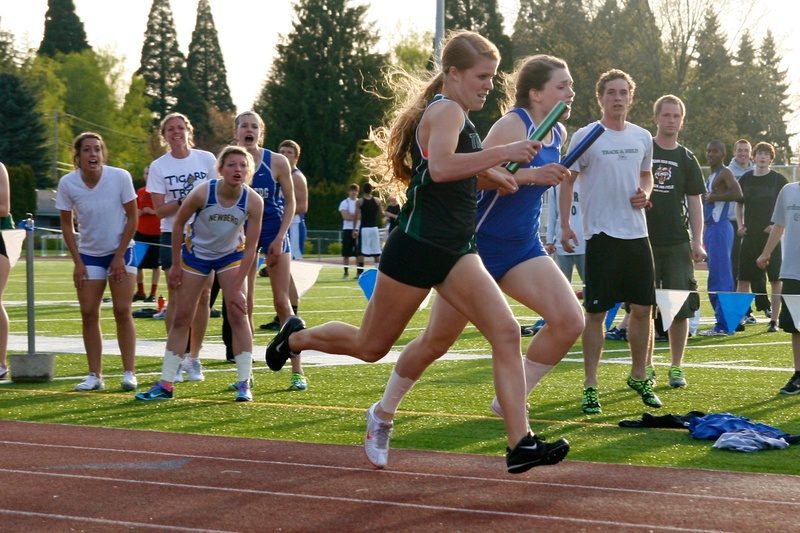 Hannah, who grew up at our church, is the Newberg runner on the track, running the anchor leg. But look in the background on the right. That’s Kaelie and Maddie and Madeleine, who ran the first three legs of the relay. They know how much a 400 hurts, because they have just given their all. And there they are, cheering on Hannah with all their might. I’ve learned how much running is a mixture of the physical and the mental. You have to ignore those voices in your head telling you that you’re too tired, that you can’t do it. Believing you can is one of the hardest battles. Having others say, “You can do it!”…especially when they are your teammates who’ve gone before…that’s priceless. The author of Hebrews looks at these saints, these people who were ancient history even at the time this was written, and yanks them to the present. The author paints a picture of the track arena, and says that these wonderful examples who’ve gone before us surround us with encouragement. Their example cheers us on to give our all as we run the race. Throw off everything that slows us down. In the ancient world, runners would strip naked to run their fastest. Even today, you watch runners peel off their sweats and put on the lightest possible spikes so they can do their best. To tie in this passage with all the identity stuff we’ve been looking at for weeks, throw off all the doubts that we don’t measure up or don’t matter. Deal with the sin in our lives-not by denial, not by comparing ourselves to others, but by admitting it and asking forgiveness and having God cast it aside. And then go! Run the race ahead of us with perseverance, give it our all as the witnesses cheer us on. But we’re not running their race. That’s another one of the reminders in these verses, that we are not primarily looking back to the past; our primary focus is what’s ahead of us. Having the encouragement is great, but if we slavishly copy what those who have gone before us have done, we can get ourselves in trouble. For the last six years in October, I’ve been out at Clackamas Community College in Oregon City for the Pacific Conference District meet. For the first four years, the course was laid out around the track. But for the last two, it’s been a different course, set up across the road from the old one. If one of the runners had tried to imitate previous champions, running their race…they would be disqualified. You’d be out of bounds. The course marked out for this year’s runners was completely different from what was before. So this year, like at many other races I’ve been to, they had a guy sitting on one of those little ATV quad thingys ahead of the pack. He knew this year’s course, and led the way through every twist and turn. Each runner could have in mind the encouragement of the runners from past years, but they needed to keep their eyes fixed on the quad, making sure to run the race set out before them. It’s our race. Our life. Our journey. Others can give examples and encouragement, but the big key is to run our race. And the biggest guide for that is Jesus. Fix our eyes on him. Jesus leads us in our race. He’s the one ahead, on the quad. Jesus is the one that our eyes are fixed to…no matter who or what has gone before. Not only that, but the prefixes of each word echo words earlier in the letter, emphasizing the beginning and the end, the Alpha and the Omega, the one who started it all, shows us the way, and once-and-for-all finished it. We fix our eyes on Jesus, because Jesus has walked this journey perfectly! He’s finished it with a finality that affects us all. Jesus is the ultimate example of the same thing we see in the saints who have gone before. In chapter 11, all the people listed acted in trust for the promise God gave them, and they continued through difficult circumstances without getting what was promised. Trust in God was something that cost them while they waited for the promise. Endure the cross. Don’t lose heart. Don’t expect a different path than the one taken by the pioneer and perfecter of our faith. I don’t know what race you have to run. But I know from looking at the cloud of witnesses…I know from looking at Jesus…I know from looking at who God is that our journey in obedience to God is never one that leaves us static and stuck. The restless beauty of this race, this journey of life, is that God is always ahead. God is leading us on, leading us up, leading us out, leading us through, leading us over-go ahead and insert whatever preposition you want. But God is leading us somewhere different than where we are now, somewhere good! Our faith is a journey of hope. Of something better. Of something ahead. We have witnesses from the past and present, cheering us on. And we’ll look at them over the next few months: biblical, historical, and personal. Maybe we’ll even introduce you to some you’ve never known. We’ll look at those who heard the promise of God, baed their lives in faith, and took risks to be obedient, even when they didn’t see results. What we will draw out as the key, as the example to follow, is the way they fixed their eyes on Jesus. Jesus will lead us on! What joy in the race! Who knows…maybe we will even get to be flesh and blood examples for others, too.